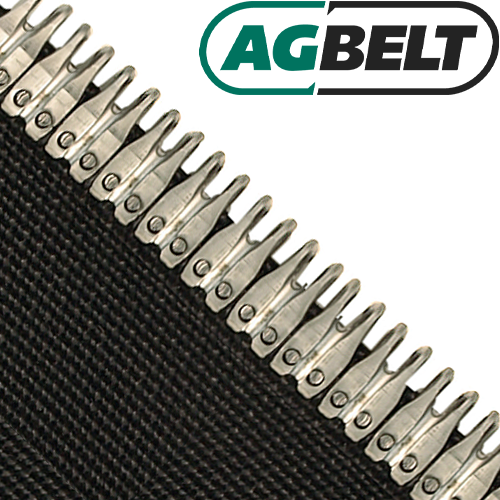 Description: AG Belt™ GripSurface™ Baler Belts feature a pattern that is a unique alternative to the impression cover. Offering a slightly more aggressive profile on both bottom and top covers the GripSurface™ baler belt provides an excellent multipurpose cover pattern that is commonly used in silage baling and on European-manufactured balers. This rotocured belt features outer plies of nylon and polyester. MATO High Performance Fasteners are the choice of many round hay baler manufacturers due to their high strength and long splice life. All fasteners are professionally installed using production style equipment for a superior set and the connecting pin is included.